If rushing cold water streams, thick foliage, beautiful native flora and fauna, natural waterfalls, and quiet secluded areas to relax sound like a great day spent…. 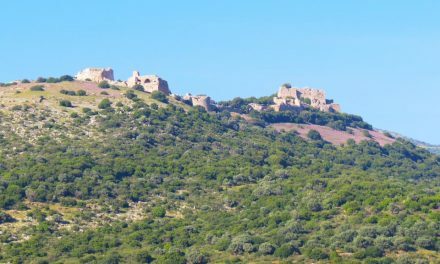 Then I would highly recommend the Nahal Snir nature reserve on your next visit to Israel. 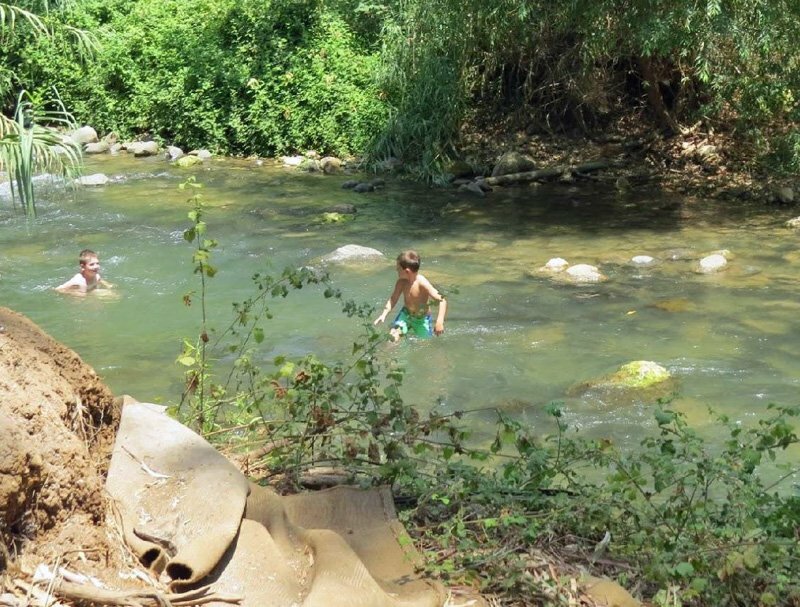 Located in beautiful northern Israel and the Upper Galilee just across from Kibbutz Hagoshrim, Nahal Snir is the largest of three tributaries feeding the Jordan River and is considered to be one of the top 10 water hikes in Israel. The entire waterway is actually over 65 km. long but only a small segment is actually in Israel and the remainder in southern Lebanon. Lisa recently spent the day there with her family biking along the Senir stream and we are very eager to share her story and pictures with you. Short (wheelchair accessible trail) about 15 minutes to traverse. This route will ends at a waterfall and a shallow wading pool. From here you can choose to continue on the trail or return to the trail head and parking area. The intermediate 30 minute hiking trail starts where the short trail ends at the waterfall. This trail is considerably more challenging as you will need to climb over large boulders and tree roots. Also, getting wet is not an option as you will need to walk through a small rivulet that is fairly chilly, but refreshing, especially on hot day. 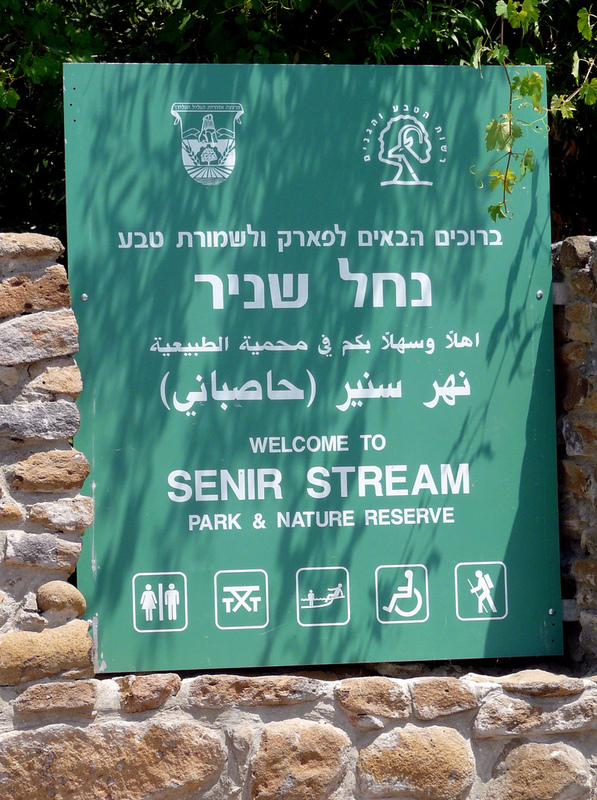 At the end of the trail, you will see a sign marked (Sof Maslul Benoni) or end of the intermediate hike. Long 90 minute route features strong water rapids combined with quiet resting places. This trail picks up where the intermediate trail ends. You will notice the river becoming deeper and stiller and this signals the end of the trail. To return to your vehicle, simply follow the the signs to the path on the left side which will take you to a convergence with the unpaved biking trail. No matter which path you choose, they all offer an abundance of things to see. So many colorful native plants and natural formations to admire and photograph depending on the season. The sound of the rushing water itself and the shady trail offers a tranquil and welcome respite. 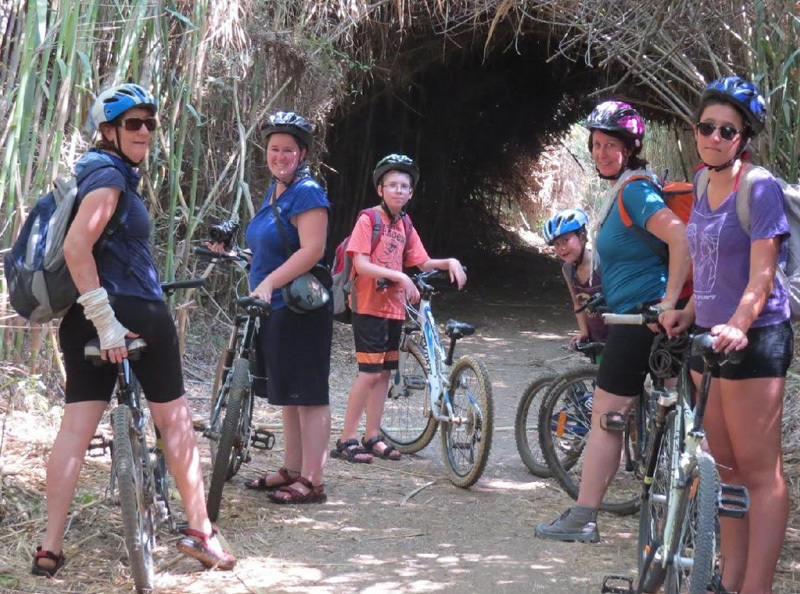 Lisa and her family decided to try the biking trail and it was really great fun. 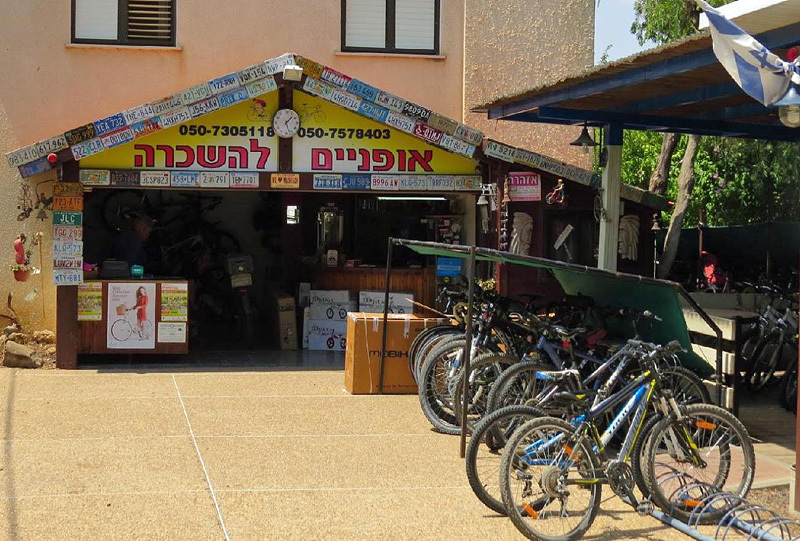 They rented their bikes from Bikesplace in Bet Hillel, a small family business with a top end bike shop and bike rentals. The owners Simcha and Assaf, a father and son outfit are very friendly and helpful fitting each person with the perfect bike. The bikes, which are mostly mountain bikes are in excellent condition. They had a six year old with them which means he got the smallest size bike handling it very well on the route. If you have a baby with you, then they also offer two wheeled chariots that hook onto the back of the bike that you can safely strap your baby or toddler into. Simcha, the owner of Bikesplace will give you a trail map and explain the routes to you. You can choose to take the route south along the river or north. Lisa and family headed off north along the path. The whole route is under a canopy of trees, so they cycled in the shade the entire time. The path is not paved in most areas but clear of debris and trees. I would plan on about 2-3 hours depending on how many stops you make and the ages of the riders. Of course, you can make it an entire day if you stop for a picnic lunch. There is a restaurant along the trail called Dag al HaDan or Fish on the Dan River. I have not tried it but i am sure this would be a tasty option as well. To cool off along the way, they stopped 2-3 times to take a refreshing dip in the very cold Snir Stream. Search Nahal Snir Nature Reserve (שמורה טבע נחל שניר) on your Waze or GPS. 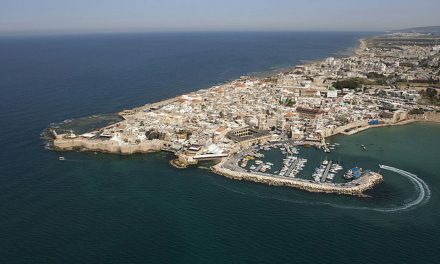 It located next to Kibbutz Hagoshrim just to the northeast of Kiryat Shemona. Hiking or water shoes – Your shoes will get wet through some sections of the trail so be prepared. Trail Map – Take one at the entrance to the trail or at the bike rental shop. Water – Minimum 1-2 Liters per person or 1 Gallon. I always prefer a Camel back. Food – There is a fish restaurant along the way but you may choose to have your own picnic. Snacks are a must as you will get hungry from the fresh air and exercise. Wadi Darga or the Dragot next to the Dead Sea. Considered to be one of the most challenging in the country, we did it last Spring. 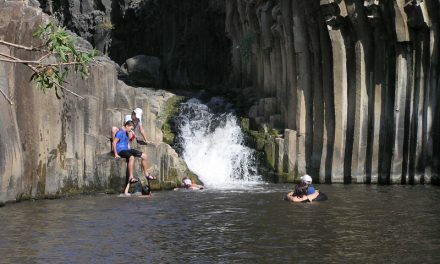 Please see Wadi Darga; An experience you wont forget. One closing piece of advice: Try to avoid driving south on Saturday nights, the traffic can be severe as people often take trips to the north over the weekends.